Minerals and Nutrients Water Panel Tests for Biological Growth. Minerals and Nutrients Water Panel. 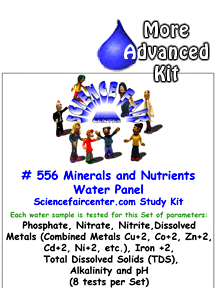 Natural mineral and nutrient panel for environmental water studies. Minerals and Nutrients Water Panel. Detailed experiment for science fair project. Water samples from lakes, creeks, ponds, rivers etc are tested for basic minerals and nutrients required for biological growth. Testing only takes a few minutes per sample. 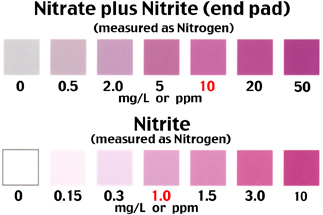 Each water sample is tested for this Set of parameters: Phosphate, Nitrate, Nitrite, Dissolved Metals (Combined Metals Cu+2, Co+2, Zn+2, Cd+2, Ni+2, etc. ), Iron +2, Total Dissolved Solids (TDS), Alkalinity and pH (8 tests per set). semiquantitative test strips. 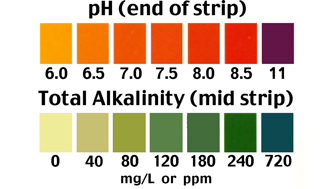 Each test strip result indicates the combined presence of heavy metals (Cu+2, Co+2, Zn+2, Cd+2, Ni+2, Pb+2, etc…) in water. The color chart for this test allows you to read Dissolved Metals in micrograms/L (ugms/L) or parts per billion (ppb). The color chart was calibrated using mixed metals solution. intensity may be necessary to reach semiquantative results. Natural mineral and nutrient panel for environmental water studies. Detailed experiment for science fair project. Water samples from lakes, creeks, ponds, rivers etc are tested for basic nutrients required for biological growth. Testing only takes a few minutes per sample.